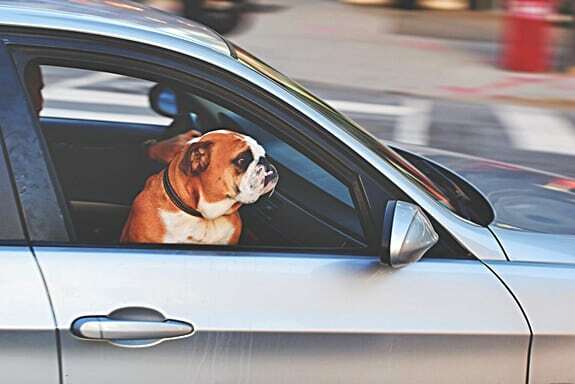 Being able to travel safely with your pet is no longer a luxury. Dogs are often considered to be a part of the family. That means it is okay to want to take them with you everywhere from a quick trip to the store, or on a family vacation. But, it’s important to keep them safe and comfortable in the process. Soft-sided dog crates help to do just that. Because traveling with dogs has become so popular, your options for soft-sided dog crates has expanded. There are more options to choose from than ever before. On the one hand, this is a good thing. The more options you have, the easier it can be to pick a crate that fits your dog’s needs. On the other hand, it can cause a lot of confusion. Sometimes having too many choices makes it more difficult to find the best solution. This is especially true if you’re not quite sure what to look for in a quality dog carrier or crate. Soft-sided crates may be different from other dog crates on the market that you’re used to. So, it’s important to know as much about them as possible to make sure they are the right fit for your dog. 1 What Is a Soft-Sided Dog Crate? 2 What Are the Pros and Cons of a Soft-Sided Kennel? 3 Which Soft Kennel Is Best for My Large Dog? 4 Are Soft Carriers Good for Small Dogs? 5 Are Crates Allowed on Airplanes? 6.1 Is a Soft Crate the Right Choice for Your Dog? 6.2 Why Should I Choose a Soft-Sided Crate? What Is a Soft-Sided Dog Crate? If your dog is already crate trained, getting them used to a soft-sided crate shouldn’t be a problem. Essentially, a soft-sided dog crate is a versatile, comfortable, and lightweight option that makes it easy for your pet to be crated safely on the go. Soft-sided crates are incredibly accessible, and most are even washable. These small kennels are also great for anxious or nervous dogs. Their soft materials won’t allow a dog to injure themselves the way a metal crate can. This article will focus on the ins and outs of soft-sided dog crates. We’ll cover their pros and cons as well as some of the best soft kennels for dogs of different sizes. We’ll also go over how easy it is to travel with these crates, and how they can make car and air travel more convenient. What Are the Pros and Cons of a Soft-Sided Kennel? Soft-sided crates tend to be better than more traditional crates for things like storage and travel. However, they may not be the type of kennel you choose to use in your home all the time. Let’s take a look at some of the advantages and disadvantages to consider when purchasing this type of crate. Portability – They are lightweight and not bulky like hard crates. In many cases, they can collapse and fold up like a suitcase for easy storage. Ventilation – When you’re traveling with your dog, you want them to be comfortable. This requires a carrier with adequate ventilation. Soft-sided carriers usually have mesh siding to increase the amount of airflow throughout the crate. Not only will this make your dog more comfortable, but they’re less likely to feel anxious if they can see the world around them. Style – Because soft crates are made of fabric and not metal or plastic, they can match your dog’s personality much better. They usually come in a variety of different colors and designs, so they easily fit into your lifestyle. Affordability – Overall, this type of crate is less expensive than plastic or metal alternatives. If you’re traveling a lot with the crate, you can feel better knowing it’s not a huge investment and can be replaced if needed. Difficult to clean – Because these crates are made from softer materials and fabric, they aren’t always as easy to clean as plastic or metal. If your dog gets anxious or has an accident, it could stain the material or leave an odor behind. Durability – While soft crates are meant for travel, they aren’t as strong or durable as hard options. They can tear or rip open easily, especially if your dog starts to dig at them or tries to claw their way out. It may be easier for your dog to open up the crate and get out, as well. Overall, soft-sided crates offer a lot of comfort and functionality. They are more vulnerable than kennels made of metal or plastic. If you’re confident that your dog won’t work to ‘destroy’ the crate (even by accident) they are great options that make traveling with a pet easier. Which Soft Kennel Is Best for My Large Dog? In choosing a kennel of any kind, you have to ask yourself what you’re looking to get out of it. Regarding soft-sided carriers, they are mostly used for travel. So, one of the most important things to look at is choosing the right size and type for your dog. Making sure they are comfortable and safe at all times should be your biggest priority. One of the best carriers for larger dogs (up to 90 pounds) is the NOZTONOZ Soft-Krate Indoor/Outdoor Pet Home. This crate offers an additional feature to consider: Where you think you’ll get the most use out of your dog’s soft-sided kennel. This particular crate is meant for indoor and outdoor use. For example, if you want to go camping with your pet or have them feel comfortable outside during an event, this is a strong and durable option that will help them feel secure. If you have a dog who gets anxious or likes to chew, it’s important to consider a crate that can handle that kind of ‘abuse.’ Unfortunately, soft-sided crates aren’t often the best option for chewers. One exception is the Petnation Port-A-Crate. It’s designed to be as sturdy as a metal carrier while providing comfort. It also doesn’t put your dog at risk for injuring themselves or breaking teeth, like a metal carrier might. This carrier can hold a dog up to 70 pounds. Are Soft Carriers Good for Small Dogs? If you’re traveling with a smaller dog, you can usually get away with using a pet carrier or bag of some kind. But, even small dogs can feel more comfortable in the confines of a familiar crate. With that in mind, they are an appropriate choice for dogs of almost any size. However, you might find that carriers or bags are a better fit. 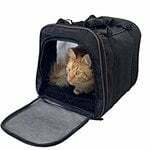 If you want a quality soft-sided carrier, one of the best options is the OxGord Soft-Sided Pet Carrier. It’s not necessarily a crate, but it is an adequate carrier for smaller dogs if you’re considering traveling with them. It can hold a dog up to two pounds. For smaller dogs, standard crates aren’t usually needed for travel. You’ll likely find it more convenient to tote your small dog around in a bag like this, rather than a larger carrier. Are Crates Allowed on Airplanes? Many dog carriers are allowed on airplanes nowadays. The carriers themselves will usually specify if they are appropriate for air travel. But, you should still familiarize yourself with different airline guidelines. Every airline is slightly different in what they allow and their stipulations. Keep in mind that pet crates are different from pet carriers. Carriers are designed for just that – carrying a dog with you wherever you go. They usually look like bags, totes, or even suitcases. Soft-sided crates are more like portable versions of their plastic or metal counterparts. In many cases, they won’t be allowed on an airplane because of their size. They may be able to be carried on as an extra item and placed under the seat. But, if you want to take your dog with you on the plane, it’s better to get a quality airline pet carrier they can fit in comfortably. One of the most critical factors in selecting the right soft-sided dog crate for your pet is to make sure it’s the right size. You shouldn’t go by weight limit alone. Instead, certain measurements should be taken of the crate itself, and your dog. Measure your dog from their nose to their tail to get the proper length. You should add anywhere from 2-4 inches from their tail to make sure they’ll have adequate room in the crate. When considering the width of your crate, a good rule of thumb is to add two inches for small dogs, and up to four inches for larger dogs. For height, measure from the top of your pet’s head to the ground. You may want to add an inch or two for comfort. If your dog has erect ears, measure from the tip of the ears instead of the top of the head. While you shouldn’t choose a crate based on weight limit alone, these limits are important to keep in mind. Allow yourself a bit of flexibility when it comes to the weight limit of a crate, so you can better ensure the safety of your dog when they are traveling. Remember, soft-sided crates are made of fabric and softer materials. While they are designed to be durable, if your dog is too heavy it could cause them to break. Is a Soft Crate the Right Choice for Your Dog? Soft crates are great for some dogs, but may not be the best solution for every pet. So, how can you decide if your dog will benefit from one? There are a few key rules to keep in mind. You know your dog better than anyone. Understanding their personality and how well they will respond is important. By recognizing some of the following traits, you’ll be able to better determine whether or not a soft-sided carrier is the best choice for your four-legged friend. Is your dog aggressive? A soft-sided carrier may not be the best choice. Even the durable ones can be chewed and clawed through by larger dogs who want to get out. Do you and your dog frequently travel? A soft crate can be a great investment for dogs on-the-go who feel comfortable in a crated environment. Is your dog anxious? Take note of whether a crate tends to calm them down or make them more nervous. If they don’t do well in a metal or plastic crate, they probably won’t do well in a softer one. How do you plan on traveling? Soft-sided crates are great for road trips; no matter how long or short they may be. You can use them in the car, and even set them up at campsites rental homes, etc. They will offer your dog a small taste of ‘home’ wherever you are. However, if most of your travel is going to be done on an airplane, you may want to consider a different type of carrier. At the very least, be sure to check out your airline’s specific guidelines for pet travel. Why Should I Choose a Soft-Sided Crate? Dogs love soft-sided crates because they are comfortable. They allow your dog to go with you more places, they mimic the feel of a metal or plastic crate, and they allow the dog to see the world. Owners love them because they are easy to store, durable, and can prevent their dog from getting injured. Like any pet product, there are pros and cons to consider, as discussed earlier in this guide. Again, you know your dog and their personality better than anyone. Deciding if a soft-sided crate is right for them is up to you. We know you want the best for your dog. That includes the best in travel gear. 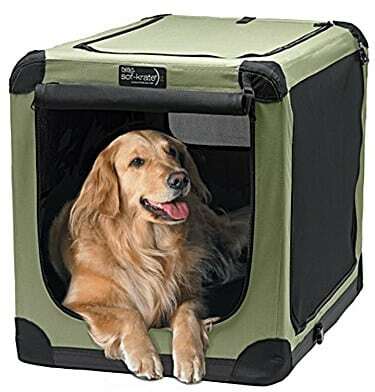 If you’re someone who wants to be able to take your dog with you wherever you go, a soft-sided crate is a great option. 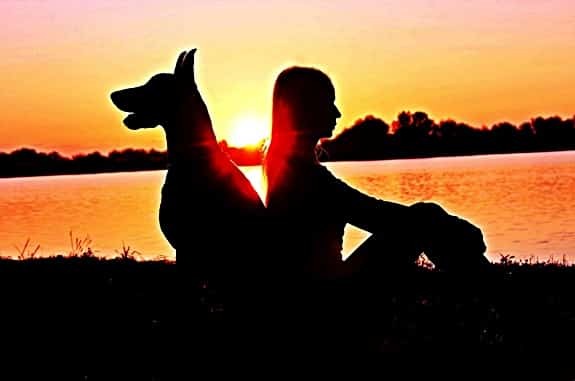 Your dog will love spending time with you, and you’ll have peace of mind knowing they are in good hands. Now that you know some of the best options for pet carriers and how to choose the right one, you can enjoy endless travels with your furry friend! How to Clean a Soft-Sided Pet Carrier (and Remove Stains from Urine)!